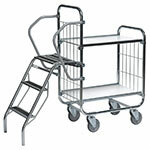 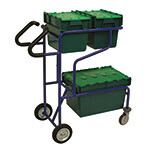 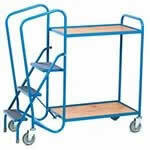 Split level, three wheeled picking trolley, distribution containers sold separately. 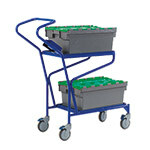 Dual level picking trolley, 150kg capacity, containers sold separately. 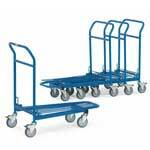 These trolleys, trucks and carts are commonly used in factories, warehouses and workshops, wherever there is a need to maneuver heavy or awkward loads between locations.. 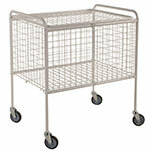 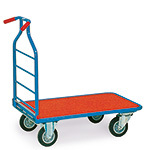 The trolleys heavy duty trolleys are idea for use in a warehouse or factory, where loads tend to be particularly weighty. 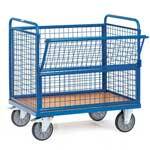 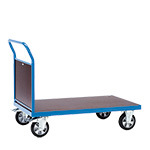 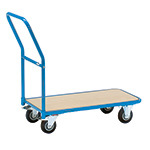 Suitable for a wide range of tasks we also offer trolleys that will provide trolleys for board or panel transportation, H/D two wheel balanced trolleys for heavy items, mesh platforms with a capacity of up to 150kg, heavy duty trucks with a capacity of up to 1250kg and many more trolleys.